Beltane is a major Pagan festival called a Sabbat. It is the union of the God and Goddess. The word Beltane means ‘Bright Fire’. It is named after the God Bel and ancient Celtic God. It is a fire festival and it is traditional to build a fire on Beltane night to honor the Sun Gods. Beltane is also a fertility festival, as it is the height of Spring and the beginning of Summer. Earth’s energy is very strong and potent with new life. 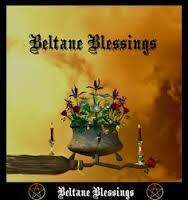 Beltane is also the start of the farming calendar. Fire is believed to have purifying qualities, it cleansed and rejuvenated both the land and the people. The ritual welcoming of the sun and the lighting of the fires was also believed to ensure fertility of the land and the people. Animals were transferred from winter pens to summer pastures, and were driven between the Beltane fires to cleanse them of evil spirits and to bring fertility and a good milk yield. In Celtic times, it would be traditional to build a big bonfire in the center of the village and have a big feast. Young men and women would dance around the maypole, while many people would marry in a handfasting (wedding). People wishing to find love or conceive would jump over a Belfire for luck in love and fertility. On Beltane we celebrate the abundance of the earth, it is a happy time when we give thanks for all we have in our lives and look forward to the bright, sunny days ahead. We celebrate the coming together of the God and the Goddess and the gifts they will bestow upon the earth. May you have a happy and joyous Beltane. Full written & photo credit goes to Wicca Teachings. I merely edited this. 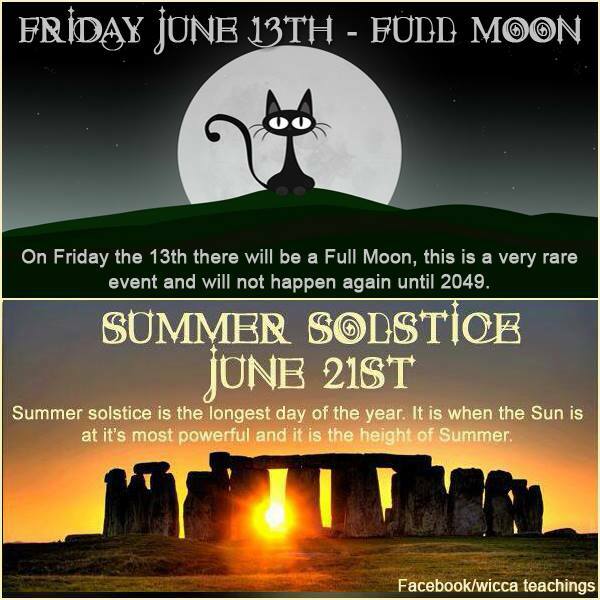 Friday the 13th may be bad luck for some, for witches and Pagans it’s often considered a magical date. After all, Friday is named for Freyja, a Norse goddess of fertility (sometimes called Frigg). The ancient Egyptians associated the number thirteen with immortality, there were twelve steps on the ladder to eternal life and knowledge; the thirteenth step meant going through death into everlasting life. Upper-class Romans required thirteen guests to be present at weddings as did the Norse vikings. 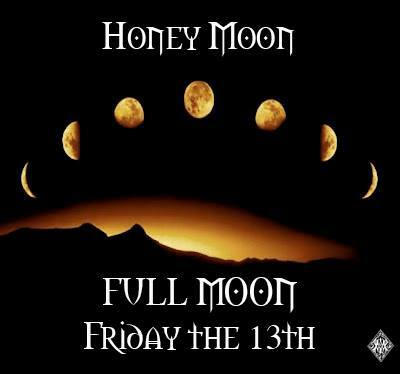 Finally, thirteen has a strong association with the moon for modern Pagans and Wiccans. There are thirteen lunar cycles each year, and many of us celebrate the Full Moons with an Esbat rite. Thirteen is the traditional number of witches in a coven. You will not see another one of these occurrences until 2049. Tonight’s Full Moon, called the Strawberry Moon because of the abundance of strawberries around at this time. It is traditional to eat strawberries on this day. If you have a lover or a love interest, give them roses as this Moon is also known as the Rose or the Love Moon. It is the perfect time to patch up relationships, get married, or find a new love. The June Moon is also known as the Honey Moon because it has a slight amber tint to it, and it is also a time when bees are at their most active. 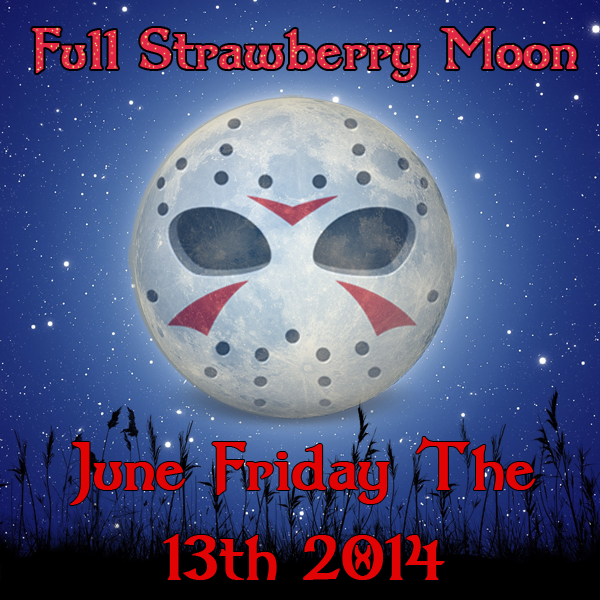 Tonight’s Full Moon also falls on Friday the 13th. 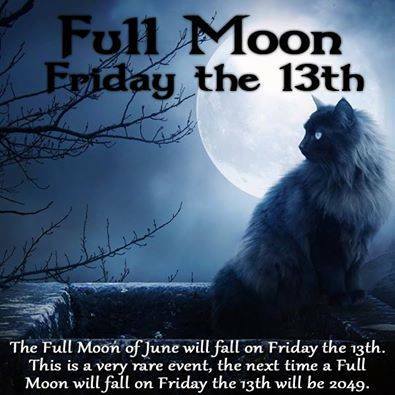 This will not be very significant for many, but for the superstitious it can hold a lot of significance and it won’t happen again for another 35 years, so it is very rare. This Moon is all about balance, as it is exactly the middle of the year. It is a time to ask yourself what you have achieved throughout the year so far and if you are happy with it. Take stock of all you have and all you wish for, and work out a path or a way to achieve your goals in the coming months. This Full Moon is a great time to list what it is you want from life and to work out what you need to do in order to achieve it. Give your message to the universe and let it know what you want. Let your dreams, hopes, and wishes manifest. The Moon is in the sign of Sagittarius which is a sign of truth, travel, and ambition. Things that were in the dark will now start to come to light, new truths will be revealed. Use the energy of this Full Moon to explore, make travel plans, see people, or talk to people you haven’t seen for a while. Sagittarius Moon asks us to step into a bigger picture, to look at our ambitions and act on them. This Full Moon will have our emotions on high alert, especially when it comes to matters of the heart. We will be feeling a little fragile at the moment so be kind and gentle with yourself, don’t be to self critical, try to stay positive and think about all the good in your life rather than the bad. There may be emotional desire to pack up and go off on an adventure to distant lands or visit places that bring up sweet memories. The sign of Sagittarius often feels its passion in travel, visiting new lands, and meeting people from other walks of life. This is the Full Moon just before the Summer Solstice, which is the height of Summer. The earth is full of energy and life. Use these energies to inspire you, be creative and go out into nature for long walks, see the beauty all around you and embrace all life has to offer. Let the Moon heal and energize you. 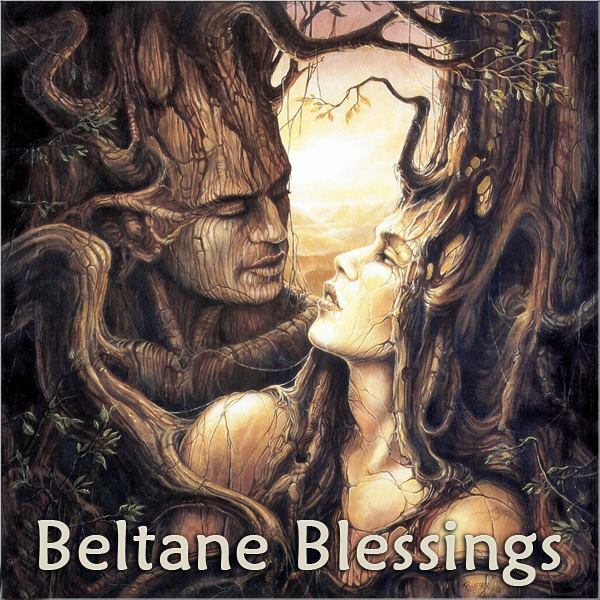 Beltane is a Celtic word which means ‘fires ofBel’ (Bel was a Celtic Sun God). It is a fire festival that celebrates of the coming of summer and the fertility of the coming year.The young horned God who the Goddess gave birth to on Yule has now matured into a man and will marry the maiden Goddess, after months of flirting since the beginning of Spring they will make love for the first time where the Goddess will become pregnant with the harvest to come. Beltane is primarily a fertility celebration. On Beltane it is a celebration of the masculine and feminine union, not just male and female, but the masculine and feminine within us all and the balance between them. The light and dark within us. The sky and earth, the sun and moon. Yin and Yang. It is customary to use a lot of reds and whites today as red represents the fertility of the female aspect and the white the fertility of the male aspect. A maypole is a tradition on Beltane the pole represents the male phallus, while the streams represents the female wrapping around the pole. Fires should be lit to bring a prosperous year and summer, the fire is to worship the Sun Gods. Traditionally people should jump over a small fire to bring luck and fertility, when jumping the fire young unmarried people would wish for marriage; young wives to ensure fertility and couples to strengthen a bond. It is also customary to make flower garlands to wear on your head and daisy chains to wear as a necklace, this will honor the Faerie folk as this is their day of celebration too. Today we should light red and white candles and place Spring flowers on our altar such as daisies, daffodils, and dandelions. Give thanks for all you have in life and make wishes for the future. If you can get any, burn hawthorn branches to bring you luck and prosperity. Beltane is a celebration, it is a time to dance, be with friends, have a shared meal with family, drink and be merry. Celebrate life. Beltane is also a time for hand-fasting, which is a Pagan wedding ceremony. Have a Blessed Beltane. May the God and Goddess watch over you.